We now begin a three page mini-series on agriculture to prevent cancer. This page discusses the use of trace minerals and enhanced soil fertility to produce healthy crops and help make the use of toxic chemicals unnecessary. Depleted soils produce foods that starve us! Most of us today are suffering from certain dangerous diet deficiencies. These cannot be remedied until the depleted soils from which our foods come are brought into proper mineral balance. The alarming fact is that foods - fruits and vegetables and grains - are now being raised on millions of acres of land that no longer contain enough of certain needed minerals. No matter how much of them we eat, these foods are starving us! Cannot judge food by appearance. You'd think, wouldn't you, that a carrot is a carrot? That one carrot is about as good as another as far as nourishment is concerned? But it isn't; one carrot may look and taste like another and yet be lacking in the particular mineral element which our systems require and which carrots are supposed to contain. It is now impossible to eat enough food to get required minerals. Laboratory tests prove that the fruits, the vegetables, the grains, the eggs, and even the milk and the meats of today are not what they were a few generations ago. (Which doubtless explains why our forefathers thrived on a selection of foods that would starve us!) No person of today can eat enough fruits and vegetables to supply his or her system with the mineral salts she requires for perfect health. Her stomach isn't big enough to hold them! And we're running to big stomachs. No longer does a balanced and fully nourishing diet consist merely of so many calories, certain vitamins or a fixed proportion of starches, proteins and carbohydrates. We now know that it must contain, in addition, something like a score of mineral salts. 99% of the population is deficient. It is bad news to learn from our leading authorities that 99 per cent of the North American people are deficient in these minerals, and that a marked deficiency in any one of the more important minerals actually results in disease. Any upset of the balance, any considerable lack of one or another element, however microscopic the body requirement may be, and we sicken, suffer, shorten our lives. So far as the records go, the first man in this field of research, the first to demonstrate that most human foods of our day are poor in minerals and that their proportions are not balanced, was Dr Charles Northen, an Alabama physician in Orlando, Florida. His discoveries and achievements are of enormous importance to mankind. Following a wide experience in general practice, Dr Northen moved to New York and made extensive studies along this line in conjunction with a famous French scientist from the Sorbonne. In the course of that work he convinced himself that there was little authentic, definite information on the chemistry of foods, and that no dependence could be placed on existing data. Foods differ widely in nutritional content depending on the quality of soil on which they are grown. He asked himself how foods could be used intelligently in the treatment of disease, when they differed so widely in content. The answer seemed to be that they could not be used intelligently. In establishing the fact that serious deficiencies existed and in searching out the reasons, he made an extensive study of the soil. It was he who first voiced the surprising assertion that, "We must make soil building the basis of food building in order to accomplish human building." "Bear in mind," says Dr Northen, "that minerals are vital to human metabolism and health - and that no plant or animal can appropriate to itself any mineral which is not present in the soil upon which it feeds. "When I first made this statement I was ridiculed. Up to that time people had paid little attention to food deficiencies and even less to soil deficiencies. Those eminent in medicine denied there was any such thing as vegetables and fruits that did not contain sufficient minerals for human needs. Eminent agricultural authorities insisted that all soil contained all necessary minerals. They reasoned that plants take what they need, and that it is the function of the human body to appropriate what it requires. Failure to do so, they said, was a symptom of disorder. "Some of our respected authorities even claimed that the so-called secondary minerals played no part whatever in human health. We now know that vitamins are complex chemical substances which are indispensable to nutrition, and that each of them is of importance for the normal function of some special structure in the body. Disorder and disease result from any vitamin deficiency. Minerals are primary, vitamins are secondary. "It is not commonly realized, however, that vitamins control the body's appropriation of minerals, and in the absence of minerals they have no function to perform. Lacking vitamins, the system can make some use of minerals, but lacking minerals, vitamins are useless. "Neither does the layman realize that there may be a pronounced difference in both foods and soils - to him one vegetable, one glass of milk, or one egg is about the same as another. Dirt is dirt, too, and he assumes that by adding a little more fertilizer to it, a satisfactory vegetable or fruit can be grown. Some foods are not worth eating. Some land, even in a virgin state, never had the required minerals. "Some of our lands, even in a virgin state, never were well balanced in mineral content. Unhappily for us, we have been systematically robbing the poor soils and the good soils alike of the very substances most necessary for health, growth, long life, and resistance to disease. Up to the time I began experimenting, almost nothing had been done to make good the theft. "The more I studied nutritional problems and the effects of mineral deficiencies upon disease, the more plainly I saw that here lay the most direct approach to better health, and the more important it became in my mind to find a method of restoring those missing minerals to our foods. The subject interested me so profoundly that I retired from active medical practice and for a good many years now I have devoted myself to it. It's a fascinating subject, for it goes to the heart of human betterment. Increasing the mineral content of fruits, vegetables, milk and eggs. The results obtained by Dr Northen are outstanding. By putting back into foods the stuff that foods are made of, he has proved himself to be a real miracle man of medicine. He has opened up the shortest and most rational route to better health. Improving the quality and quantity of food. Mental and physical development of children. Mineral deficiencies affect our health and may also affect the growth and development, both mental and physical, of our children. Certainly physical well-being is more directly dependent upon the minerals we take into our systems than upon calories or vitamins or upon the precise proportions of starch, protein, or carbohydrates we consume. It is now agreed that at least 16 mineral elements are indispensable for normal nutrition. Several more are always found in small amounts in the body, although their precise physiological role has not been determined. Of the 11 indispensable salts, calcium, phosphorous and iron are perhaps the most important. The importance of calcium and vitamin D.
Calcium is the dominant nerve controller; it powerfully affects the cell formation of all living things and regulates nerve action. It governs contractility of the muscles and the rhythmic beat of the heart. It also coordinates the other mineral elements and corrects disturbances made by them. It works only in sunlight. Vitamin D is its buddy. Problems in health and behavior from a mineral deficient diet. What does such a deficiency mean? How would it affect your health or mine? So many morbid conditions and actual diseases may result that it is almost hopeless to catalog them. Included in the list are rickets, bone deformities, bad teeth, nervous disorders, reduced resistance to other diseases, fatigability, and behavior disturbances such as incorrigibility, assaultiveness, nonadaptability. Problems with teeth, nose, throat, glands, vision, anemia, and more. Here's one specific example. The soil around a certain Midwest city is poor in calcium. Three hundred children of this community were examined and nearly 90 per cent had bad teeth, 69 percent showed affections of the nose and throat, swollen glands, enlarged or diseased tonsils. More than one-third had defective vision, round shoulders, bow legs and anemia. No dental decay with adequate calcium and phosphorous. Calcium and phosphorous appear to pull in double harness. A child requires as much per day as two grown men, but studies indicate a common deficiency of both in our food. When there are enough phosphates in the blood there can be no dental decay. And research on farm animals points to a deficiency of one or the other as the cause of serious losses to the farmers, and when the soil is poor in phosphorous these animals become bonechewers. Iron and copper increase the oxygen carrying capacity of the blood. Iron is an essential constituent of the oxygen-carrying pigment of the blood: iron starvation results in anemia, and yet iron cannot be assimilated unless some copper is contained in the diet. In Florida many cattle die from an obscure disease called "salt sickness." It has been found to arise from a lack of iron and copper in the soil and hence in the grass. A man may starve for want of these elements just as a beef "critter" starves. Iodine for proper thyroid functioning. If iodine is not present in our foods the function of the thyroid gland is disturbed and goiter afflicts us. The human body requires only 14,000ths of a milligram daily, yet we have a distinct "goiter belt" in the Great Lakes section, and in parts of the Northwest the soil is so poor in iodine that the disease is common. So it goes down through the list, each mineral element playing a definite role in nutrition. A characteristic set of symptoms, just as specific as any vitamin-deficiency disease, follows a deficiency in any one of them. It is alarming, therefore, to face the fact that we are starving for these precious, health-giving substances. Minerals are better absorbed from food rather than from supplements. Very well, you say, if our foods are poor in the mineral salts they are supposed to contain, why not resort to dosing with supplements'? That is precisely what is being done, or being attempted. However, those who should know assert that the human system appropriates these elements to the best advantage in the food form. Calcium, for instance, is best supplied in dark, leafy greens. This is what the body understands and assimilates. The curing of diet deficiencies by drugging hasn't worked out so well. Consider those 16 indispensable mineral elements and those others which presumably perform some obscure function as yet undetermined. Aside from calcium and phosphorous, they are needed only in infinitesimal quantities, and the activity of one may be dependent upon the presence of another. To determine the precise requirements of each individual case and to attempt to weigh it out on a druggist's scales would appear hopeless. It is necessary to re-mineralize farm soils. It is a serious problem. But there is the hopeful side to the picture: nature can and will solve this problem if she is encouraged to do so. The minerals in fruit and vegetables are colloidal; they are in a state of such extremely fine suspension that they can be assimilated by the human system. It is merely a question of giving back to nature the materials with which she works. We must rebuild our soils: put back the minerals we have taken out. That sounds difficult but it isn't. Neither is it expensive. Therein lies the short cut to better health and longer life! When Dr Charles Northen first asserted that many foods were lacking in mineral content and that this deficiency was due solely to an absence of those elements in the soil, his findings were challenged and he was called a crank. But differences of opinion in the medical profession are not uncommon (it was only 60 years ago that the Medical Society of Boston passed a resolution condemning the use of bathtubs) and he persisted in his assertion that inasmuch as foods did not contain what they were supposed to contain, no physician could with certainty prescribe a diet to overcome physical ills. He showed that the textbooks are not dependable because many of the analyses in them were made many years ago, perhaps from products raised in virgin soils, whereas our soils have been constantly depleted. Soil analyses, he pointed out, reflect only the content of the samples. One analysis may be entirely different from another made 10 miles away. "And so what?" came the query. Dr Northen undertook to demonstrate that something could be done about it. By reestablishing a proper soil balance he actually grew crops that contained an ample amount of the desired minerals. This was incredible. It was contrary to the books and it upset everything connected with diet practice. The scoffers began to pay attention to him. Recently the Southern Medical Association, realizing the hopelessness of trying to remedy nutritional deficiencies without positive factors to work with, recommended a careful study to determine the real mineral content of foodstuffs and the variations due to soil depletion in different localities. These progressive medical professionals are awake to the importance of prevention. Dr. Northen went even further and proved that crops grown in properly mineralized soil were bigger and better; that seeds germinated quicker, grew more rapidly and made larger plants; that trees were healthier and bore more fruit of better quality. He is an elderly, retiring man, with a warm smile and an engaging personality. He is a trifle shy until he opens upon his pet topic; then his diffidence disappears and he speaks with authority. His mind is a storehouse crammed with precise, scientific data about soil and food chemistry, the complicated life processes of plants, animals, and human beings - and the effect of malnutrition upon all three. He is perhaps as close to the secret of life as any man anywhere. "Do you call yourself a soil or a food chemist?" I inquired. Sick soils produce sick plants and sick people. "Neither. I'm an MD. My work lies in the field of biochemistry and nutrition. I gave up medicine because this is a wider and more important work. Sick soils mean sick plants, sick animals, and sick people. Physical, mental and moral fitness depends largely upon an ample supply and a proper proportion of the minerals in our foods. Nerve function, nerve stability, nerve cell-building likewise depend thereon. I'm really a doctor of sick soils." "Do you mean to imply that the vegetables I'm raising on my farm are sick?" I asked. "Precisely! They're as weak and undernourished as anemic children. They're not much good as food. Look at the pests and the diseases that plague them. Insecticides cost farmers nearly as much as fertilizer these days. "A healthy plant, however, grown in soil properly balanced, can and will resist most insect pests. That very characteristic makes it a better food product. You have tuberculosis and pneumonia germs in your system but you're strong enough to throw them off. Similarly, a really healthy plant will pretty nearly take care of itself in the battle against insects and blights and will also give the human system what it requires." Enormous savings for the farmer. "Good heavens! Do you realize what that means to agriculture?" "Perfectly. Enormous savings. Better crops. Lowered living costs to the rest of us. But I'm not so much interested in agriculture as in health." "It sounds beautifully theoretical and utterly impractical to me," I told the doctor, whereupon he gave me some of his case records. Mineralized plants resist disease and insects. He had grown tomato and cucumber plants, both healthy and diseased, where the vines intertwined. The bugs ate up the diseased and refused to touch the healthy plants! He showed me interesting analyses of citrus fruit, the chemistry and the food value of which accurately reflected the soil treatment the trees received. There is no space here to go fully into Dr Northen's work, but it is of such importance as to rank with that of Burbank, the plant wizard, and with that of our famous physiologists and nutritional experts. Healthy plants produce healthy people. Food with higher mineral content, better storage, sounder cell structure. "Healthy plants mean healthy people," said he. "We can't raise a strong race on a weak soil. Why don't you try mending the deficiencies on your farm and growing more minerals into your crops?" I did try and I succeeded. I was planting a large acreage of celery and under Dr Northen's direction I fed minerals into certain blocks of the land in varying amounts. When the plants from this soil were mature I had them analyzed. along with celery from other parts of the state. It was the most careful and comprehensive study of this kind ever made. and it included over 250 separate chemical determinations. I was amazed to learn that my celery had more than twice the mineral content of the best grown elsewhere. Furthermore, it kept much better, with and without refrigeration, proving that the cell structure was sounder. In 1927, Mr. W. W. Kincaid, a "gentleman farmer" of Niagara Falls. heard an address by Dr Northen and was so impressed that he began extensive experiments in the mineral feeding of plants and animals. The results he has accomplished are conspicuous. He set himself the task of increasing the iodine in the milk from his dairy herd. He has succeeded in adding both iodine and iron so liberally that one glass of his milk contains all of these minerals that an adult man requires per day. Is this significant? Listen to these incredible figures taken from a bulletin of the South Carolina Food Research Commission: "In many sections three out of five persons have goiter and a recent estimate states that 30 million people in the United States suffer from it." Champion dairy cow raised on mineralized pasturage. Mr. Kincaid took a brown Swiss heifer calf which was dropped in the stockyards. By raising her on mineralized pasturage and a properly balanced diet, he made her the third all-time champion of her breed! In one season she gave 21,924 pounds of milk. He raised her butterfat production from 410 pounds in one year to 1,037 pounds. Results like these are of invaluable importance. Productive capacity of soil down 25 to 50% in last 50 years (this article was published in 1936), increased heart disease, deformities, arthritis. "Many states show a marked reduction in the productive capacity of the soil, in many districts amounting to a 25 to 50 per cent reduction in the last 50 years. Some areas show a tenfold variation in calcium. Some show a sixty-fold variation in phosphorous. Authorities see soil depletion, barren livestock, increased human death rate due to heart disease, deformities, arthritis, increased dental caries - all due to lack of essential minerals in plant foods." "It is neither a complicated nor an expensive undertaking to restore our soils to balance and thereby work a real miracle in the control of disease." says Dr Northen. "As a matter of fact, it's a money-making move for the farmer, and any competent soil chemist can tell him how to proceed." "First determine by analysis the precise chemistry of any given soil, then correct the deficiencies by putting down enough of the missing elements to restore its balance. The same care should be used as in prescribing for a sick patient, for proportions are of vital importance. "In my early experiments I found it extremely difficult to get the variety of minerals needed in the form in which I wanted to use them, but advancement in chemistry, and especially our ever-increasing knowledge of colloidal chemistry, has solved that difficulty. It is now possible, by the use of minerals in colloidal form, to prescribe a cheap and effective system of soil correction which meets this vital need and one which fits in admirably with nature's plans. "Soils seriously deficient in minerals cannot produce plant life competent to maintain our needs, and with the continuous cropping and shipping away of those concentrates, the condition becomes worse. Improved resistance to infectious disease. We do not know how well we can feel or how long we can live. "He's absolutely right. Prevention of disease is easier, more practical, and more economical than cure. But not until foods are standardized on a basis of what they contain instead of what they look like, can the dietitian prescribe them with intelligence and with effect. "There was a time when medical therapy had no standards because the therapeutic elements in drugs had not been definitely determined on a chemical basis. Pharmaceutical houses have changed all that. Food chemistry on the other hand, has depended almost entirely upon governmental agencies for its research, and in our real knowledge of values we are about where medicine was a century ago. The public can help by demanding quality in its food. "Disease preys most surely and most viciously on the undernourished and unfit plants, animals, and human beings alike, and when the importance of these obscure mineral elements is fully realized the chemistry of life will have to be rewritten. No man knows his mental or bodily capacity, how well he can feel or how long he can live, for we are all cripples and weaklings. It is a disgrace to science. Happily, chemistry is being rewritten and we're on our way to better health by returning to the soil the things we have stolen from it. It is simpler to cure sick soils than sick people. "The public can help; it can hasten the change. How? By demanding quality in its food. By insisting that our doctors and our health departments establish scientific standards of nutritional value. "The growers will quickly respond. They can put back those minerals almost overnight, and by doing so they can actually make money through bigger and better crops. "It is simpler to cure sick soils than sick people - which shall we choose?" New way to grow rice may double yields. Voisin, Andre, Soil, Grass & Cancer, read free online. This long-out-of-print classic showed that soil fertility is directly linked to human and animal disease. Almost a half-century ago, Andre Voisin had already grasped the importance of the subterranean world. He mapped the elements of the soil and their effects on plants, and ultimately, animal and human life as well. He saw the hidden danger in oversimplified fertilization practices and the use of toxic chemicals that ignore the delicate balance of trace minerals and nutrients in the soil. This is not, however, merely a persuasive testament to the link between soil, human and animal health. It is also essential reading for anyone committed to increasing both the quality and the profitability of their pastures. While grass and livestock farmers will benefit most from the wealth of information on rotation management and fertilization practices, there is much in this book for anyone who makes a living from the earth. With a volume of meticulously researched information, Voisin issues a call to agricultural scientists, veterinarians, dietitians and intelligent farmers to stand up and acknowledge the responsibilities they bear in the matter of public health. He writes as well to the alarmed consumer of agricultural products, hoping to spread the knowledge of the possibilities of protective medicine as part of a concerted attempt to remove the causes of ill health, disease and, in particular, cancer. Source of information for farmers. Source of trace minerals - Azomite. Global warming or new ice age? Northwest Passage closed by ice indefinitely. Dehydrate thinly sliced squash and zuchini to make chips. We prefer to store dry items in wide-mouth mason jars with plastic screw-on lids. Make home-made V8 juice every day. Put 8 different vegetables in a blender with water. Easy, quick and nutritious. Thorium molten-salt reactor can provide inexpensive clean energy for the new millenium. We wonder if the Inergy Kodiak and Devil Watt systems would work well together? An efficient wood stove can provide home heating & heat for cooking, and is carbon neutral. A manual hydraulic wood splitter is easy to use and silent. What was the staple food of Roman gladiators? A porridge made of barley and beans. Electricity storage with super capacitor. "The Adam and Eve Story"
Tectonic plate movement may be increasing. Search the Internet for plate shift news. "Hope for the best, prepare for the worst." Farmers wishing to make the switch from unsustainable chemical agriculture to sustainable eco-agriculture can start by subscribing to this newspaper: Acres USA - A Voice for Eco-Agriculture, P.O. Box 91299, Austin, TX 78709 telephone (515) 892-4400 fax (515) 892-4448 www.acresusa.com. Acres USA hosts an annual conference on Eco-Agriculture which includes seminars on various aspects of sustainable agriculture. Acres USA also has a mail order catalog of books on all aspects of sustainable agriculture. A good source of trace minerals for gardeners and farmers is Azomite. You can read about Azomite and order it from www.azomite.com. Other similar products are advertised in the pages of the Acres USA newspaper. For more information on soil re-mineralization do an Internet search for rock dust, soil remineralization, soil remineralisation, kelp, etc. Cosmic rays (charged particles) penetrating the Earth's atmosphere cause cloud formation 1, 2, 3, 4, 5, 6, 7, 8 which has a cooling effect (and flooding) on the planet. Like snow and ice, clouds have a high albedo - they reflect sunlight back into space causing the Earth to cool. The Earth's magnetic field has been weakening for the past 400+ years 1, 2, 3, 4 allowing increased cosmic rays to reach the Earth. The sun's activity is also weakening 1, 2, and less solar wind allows even more cosmic rays 1, 2 to reach the Earth. This double whammy of both the Earth's magnetic field and sun's activity weakening at the same time may allow a megadose of cosmic rays to impact the Earth. Increased cosmic rays can trigger increased earthquakes and volcanism. Increased volcanic ash 1, 2 in the atmosphere has a cooling effect on the Earth. When the Earth's crust cools it shrinks 1, 2, 3, 4 not by much, but shrinking by 10 feet over a distance of a thousand miles per degree centigrade of cooling can cause faults to unlock, and new cracks 1, 2, 3, 4, 5, 6 in the Earth to appear. Cosmic rays interact with silica (a semi-conductor) in the Earth, producing heat and increasing the liquidity of magma. About 75% of Earth's volcanoes (including Yellowstone and Vesuvius) are high in silica. Volcanoes high in silica have high viscosity magma and are particularly explosive. Increased liquidity of magma leads to eruptions. So we have two things happening at the same time. The Earth's magma is heating up, leading to increased volcanism, and the Earth's crust is cooling down, leading to increased earthquakes. The average number of volcanoes that erupt in a given year is 50 - 70. Some volcanoes erupt more than once in a year. The average number of volcanic eruptions per year is about 60 - 80. There are millions of underwater volcanoes and vents producing hot water in the oceans. Heating of the ocean surface can dramatically increase evaporation, which rises into the atmosphere to increase cloud cover and precipitation. Author Robert Felix suggests that this is a mechanism whereby magnetic pole reversals cause ice ages. Ash from land volcanoes cools the atmosphere, and evaporation caused by underwater volcanoes increases moisture in the atmosphere, resulting in a situation of increasing cold, massive precipitation (snow), and intense storms. Another factor mentioned by Robert Felix in his ebook Not By Fire But By Ice is that the Earth's magnetic field helps hold the continents in place. When the Earth's magnetic field weakens or disappears, the Earth's plates move more freely, which in turn increases the earthquakes and volcanism that cause ice ages. Robert Felix is predicting we are entering a full ice age, and that the transition could be very quick. Here is an interesting documentary that also sees a coming ice age, but with different causes and the hope of preventing it if we take appropriate action. Six large Taiwan buildings knocked off foundations by 6.4 earthquake February 2018. The sun is entering a quiet phase called a "Grand Solar Minimum", with reduced sun spots and less solar wind. Total Solar Irradiance (TSI) reaching the Earth is greater when there are more sunspots. Reduced energy from the sun has a cooling effect on the Earth. Solar activity is predicted to fall during solar cycles 25 - 27, with maximum cold during solar cycle 26 when solar activity is expected to fall by 60% (during the 2030's) 1. TSI reaching the Earth varies with the level of solar activity and also with variations in the Earth's orbital path around the sun. It was cold in the 1970's when sunspots were less, and this cold is repeating now. However, this time it is expected to get much worse. Another factor is the other planets in our solar system. When the four gas giants (Jupiter, Saturn, Uranus, Neptune) are on the same side of the sun, then their combined gravity tends to pull the Earth away from the sun whenever Earth passes between the gas giants and the sun. If this happens during winter in the northern hemisphere of Earth, then there is a longer & colder winter and shorter growing season over the majority of Earth's land mass. This effect of other planets pulling Earth away from the sun can reduce Total Solar Irradiance reaching the winter land mass in the northern hemisphere by as much as 12%. This can be significant, especially when added to the other factors mentioned above, and was a factor in making both the Maunder and Dalton Minimums so terrible, and will be a factor in the coming Grand Solar Minimum. See the position of planets at www.solarsystemscope.com . Planetary effect cooling 1, 2, 3, 4, 5 will be intense October 2024 and October 2034. New mini ice age 2024 maths. Some scientists are predicting a 4.9°C decline in temperature during the 2030's. Ukraine restricts wheat export - August 2018. Global wheat supply falls to crisis levels - August 2018. The Earth's magnetic field is weakening to a degree generally seen only during magnetic pole reversals, an event that happens about every quarter million years. This is the first time a magnetic pole reversal has happened since modern man has been on this planet. Grand Solar Minimums happen about every one or two hundred years. So we are faced with a combination of a weak magnetic field around the Earth and a Grand Solar Minimum, resulting in an unprecedented increase in cosmic radiation penetrating the Earth's atmosphere, which causes increased cloud formation and precipitation (rain, hail, snow), increased earthquakes and volcanism, global cooling, and shorter & wetter growing seasons. The 30 years from 2020 to 2050 are expected to be the trough of the Grand Solar Minimum and may be very difficult for all life on this planet. "The likelihood of a severe geo-magnetic event crippling our electric grid is 100%." - Y. Clarke (D-NY), Sr Member House Homeland Security Committee. This could be due to a solar flare striking the Earth such as the Carrington Event that happened in 1859, or a man-made event such as an electromagnetic pulse (EMP) weapon or cyber attack. The likelihood of another solar flare hitting the Earth is 100%. It is just a question of when. Scientists estimate the probability at 12% in the next decade. See where electrical power is out. A long-term "grid down" scenario could kill 90% of the U.S. population within a year according to this paper. Surviving a Catastrophic Power Outage. FEMA is prepared to assist during local disasters, but something that affects the entire country will be beyond FEMA's capacity. September 2018 - National Preparedness Month. FEMA Ready Campaign (204 pages). In particular, see the Disaster Supplies Checklist starting page 195. EIS Council "Black Sky Hazard". All utility wires (electrical, phone, cable TV, Internet, etc.) should be buried in the ground for maximum protection. Six months grid down prep may not be enough 1, 2. The Milankovitch cycles do not suggest that a major ice age is imminent. 1, 2, 3, 4, 5, 6, 7. On the other hand, the start and end dates of major ice ages do not necessarily coincide with the Milankovitch cycles suggesting that other factors are involved. Plus, the Milankovich cycles produce slow changes over thousands of years. The actual start and end dates of ice ages are abrupt. When the solar system is near to the galactic plane, more cosmic rays hit the Earth. When our solar system passes through the spiral arms of the Milky Way galaxy, the galactic cosmic ray bombardment of Earth is much higher and the Earth gets colder. Major ice ages generally occur when the Earth is transiting one of the spiral arms of the Milky Way galaxy. The Earth is in the Orion spiral arm now, and we leave it to scientists to determine the effect this will have on Earth's climate. The 65 year Atlantic Multidecadal Oscillation (AMO) is turning cold. This will affect Europe during the next 30+ years, in addition to all the other factors. Source of chart. Cooling of the North Atlantic will cause increased sea ice throughout the region and into the Arctic. During the Medieval Warm Period (AD 950 - 1250) the population of Europe tripled 1, 2. This was followed by the Little Ice Age (1450 - 1850) that caused mass starvation. Plus, hunger-weakened immune systems and lifestyle defects opened the way for the Black Death. Millions died ("27% mortality amongst the upper classes, to 40-70% amongst the peasantry") 1, 2. We are using dates found in this paper on page 4. European agriculture prior to the Little Ice Age was largely beans/legumes ("Pease porridge hot, pease porridge cold, pease porridge in the pot nine days old.") and grains (spelt/wheat, rye, barley, oats, etc.) Shorter growing seasons and early snow flattened the stalks of the plants destroying the harvest. After lost harvests and great hunger, agriculture adapted toward root vegetables (potatoes, sweet potatoes, turnips, parsnips, beets, carrots, etc. ), and clover which, together with damaged root vegetables, was used to feed animals. This is the origin of the "meat and potatoes" diet that still prevails today 1, 2. French farming under the control of the aristocracy failed to adapt, and the resulting hunger was one of the causes of the French Revolution. Many solar scientists accept that global cooling began 2014/2015 and will hit maximum cold in 2031. The debate among these scholars is how long it will last. Will we experience the equivalent of a Dalton Minimum (about 30 years of cold) or a Maunder Minimum (about 70 years of cold), or longer? Author John Casey is predicting 30 years of cold comparable to the Dalton Minimum, and 400 years of relative cold before the world returns to the warmth of the recent past. People have time to prepare if they begin soon. After 2027 all bets are off. The 8 years from 2027 to 2035 will be intense. This prediction of 8 really bad years is based on the solar research found here 1, 2, 3, 4, 5, 6, 7. Many places may see snow staying on the ground all through the summer. The global "fertility rate" has been declining for many years. From its peak of 7 billion in 2012, the human population on planet Earth may soon be in decline. This will be due to the baby-boom generation starting to die off, infertility of potential parents, radiation exposure, the opioid crisis killing young people, heavily indebted young people not wanting to have children, the Chinese one child policy (now discontinued), aging populations in many countries, and other reasons in different areas of the world. At the start of the last mini ice age, 25% of the European population died BEFORE the black death appeared. It has been forecast that planetary population may decline signicantly by 2028. And the cold years will have barely begun. Deagel.com is predicting the population of Canada (now 35 million) will decline to 26 million by 2025. They are predicting the population of the United States (now 326 million) will decline to 99 million by 2025. Learn from the Blizzard of 1977. The weather was so cold for so long that electricity and natural gas needed to be turned off on a rotating basis. Roads were blocked by abandoned cars. Airports were closed. Fire trucks froze when trying to fight fires. Blowing snow virtually buried some homes. Looting became a problem. - add extra 2x4 bracing to hold up your roof during heavy snowfall. Decide now how you will remove excess snow from your roof. Don't wait until it is too late. - use hanger strap to tie down your roof to the top of interior and exterior walls in case of high winds. Anchor your house to the foundation, and tie down each floor to the one below. - increase insulation everywhere possible, including your basement ceiling. If heat sources fail, the basement may be the warmest room in your home due to heat from the Earth. Add shut-off valves to turn off water to the higher floors of your home, and be prepared to live in your basement as a last resort during winter. Protect your windows with plastic security film and exterior storm shutters. - add a back-up sump pump that uses no electricity. - prepare for failure of the electricity grid for months to years resulting from a solar storm. Get off the grid! - prepare for failure of the natural gas supply (heat and cool your home with a ground source heat pump, install a high efficiency wood stove). - prepare for failure of the transportation system (imagine no food or gasoline being delivered to your town for an extended time). - prepare for failure of the (frozen) water supply (install a composting toilet). Have large containers full of water ready in case of need. Where will the water come from to refill the containers? - vegetables can be grown locally, even indoors (using LED grow lights). Make vegetables the foundation of your diet. Grow your own, and have a supply of seeds. It will not be possible to store enough food. You must grow your food. Sprouts, container gardening. The theme is "anti-fragility". Every aspect of individual life and society as a whole needs to become more robust if it is to survive in a Grand Solar Minimum. Every home should begin stocking up food. There is no harm in pre-purchasing food you will be consuming anyway. Not every year will have crop failures. A food supply sufficient to get your family through two years is a good start. Food like bags of rice or lentils will remain edible a long time if kept dry. Any not used can be donated to a food bank. If global cooling occurs as we are suggesting, it is possible that food shortages could begin to occur as soon as 2019. Expect rising prices. In many places, outdoor agriculture and construction may not be possible after 2027. Countries in North Africa may find new opportunities for agriculture in the desert as precipitation increases globally. The Australian outback may be headed for a mega-drought 1, 2, 3, 4. Whether or not you agree that global cooling is coming, can you afford to take the risk by not being prepared? Global crop loss map. People can adapt to almost anything if given sufficient time. It was not raining when Noah built his ark. * The onset of these conditions can be very abrupt and very severe. - Dramatic increase in days with overcast skies. - Decline in the intensity of sunlight. * Malnutrition lead to weakened immune system. Produced influenza epidemics. * Reoccurrence of plagues such as the Black Plague. * Parasites (i.e. fusarium nivale), which thrived under snow cover, devastated crops. * Grain storage in cool damp conditions produced fungus (Ergot Blight). Contaminated grains when consumed caused an illness (St. Anthony's Fire) producing convulsions, hallucinations, gangrenous rotting of extremities. * Flooding created swamplands that became mosquito breeding grounds and introduced tropical diseases such as malaria throughout Europe. * During hot summers, cold air aloft produced killer hailstorms (massive hailstones that could kill a cow). * Glacier advance swallowed up entire alpine villages. * Ruptured glacial ice dams produced deadly floods. The cheapest and easiest way to create an emergency food supply is to buy bags of wheat, rice, split peas, lentils, etc. A man needs about 2,500 calories per day. A woman about 2,000 calories per day. One half cup (100 grams) of dry grain or legume has about 350 calories. A man will need 3.5 cups (700 grams) and a woman about 3 cups (600 grams) daily. So, to feed a man for a year you will need 365 x 700 grams = 255 kg or about 560 pounds of grains and legumes. To feed a woman for a year you will need about 365 x 600 grams = 220 kg or about 480 pounds of grains and legumes. That is roughly 1,000 pounds of dry grains and legumes per year to feed the two of you. By eating both grains and legumes each day, you will have better protein. You might store your grains and legumes in plastic bins in a place where they will stay cool and dry, but do not let the food freeze. Put a piece of masking tape on each bin and mark the purchase date of the contents. First in, first out. Always eat first that which was purchased first. Dry food can last 20 to 40 or more years. Pea protein is of such high quality that we suggest pea soup should be a staple of any survival plan. There are recipes for pea soup on the Internet. An emergency supply of dried peas or split peas is inexpensive to buy, easy to store, and could get you through the rough times that may be coming. Learn how to make pea soup now. Grow peas in your garden and dry them in the sun or dehydrator. Experiment with growing peas on your balcony, indoors, anywhere and everywhere. Freeze dried meals are available from Mountain House, Backpacker's Pantry and other companies. You might also set aside some water, water purification method(s), medical supplies, first aid kit, iodine, hydrogen peroxide, dust masks, essential oils, soap, laundry soap, bleach, toothpaste, tooth brushes, toilet paper, paper towels, tea lights, candle lanterns, matches & lighters & fire starters, radio, batteries, pet supplies, maps, compass, organic seeds, how-to books, self-defense items, clothes for weather extremes, non-motor transportation, hiking boots, portable solar power, manual tools, goods to barter, etc. Useful skills to develop include farmer, paramedic, ham radio, back packer, soldier, animal husbandry, carpenter, electrician, plumber, auto mechanic... For security, a suggested minimum group size is 6 adults. Women should change their appearance so that they look like men. This will make the group appear stronger and reduce the likelihood of attack. Both genders need weapons training, and take their turn standing watch at night. Food stored in glass jars lasts longer than food in cans. Food in jars can last 20 or more years. Food in cans lasts only about two years. However, food in jars needs a lot of shelf space compared to the dried food. Best Before does not mean Bad After. Food will contain useful nutritional value long after the Best Before date. If it looks or smells bad, do not eat it. If the lid pops off food stored in glass jars, do not eat it. If the global grain harvest begins to decline, agriculture in Canada, Europe, Russia and other grain growing countries may need to adapt quickly. Also watch the declining quality of the global grain harvest (low protein, ergot infected). Grain importing countries may wish to begin considering other options. Compared to annual production of more than 2,400 million tonnes, global cereal stocks of about 600 million tonnes amount to less than 3 months of reserve capacity. It would be helpful if we stopped feeding grain to animals for meat production. At present about 40% of the world grain production is fed to animals. We should also stop using ethanol made from corn to fuel automobiles. Forty percent of the U.S. corn crop is used for producing ethanol, 45% goes to feed animals, and only 15% is consumed by humans. Cold weather veggies include: arugula, beets, broccoli, Brussels sprouts, bush beans, carrots, cauliflower, cabbage, Chinese cabbage, green onions, kale, kohlrabi, leaf lettuce, mizuna, mustard, peas, radishes, rutabaga, spinach, Swiss chard, tatsoi, turnips. Best herbs for indoors: basil, parsley, rosemary, bay, oregano, chervil, thyme, chives, sage, tarragon. People are rightly concerned about rising carbon dioxide in the atmosphere and there is a global effort to limit this increase. However, there is still an incredible amount of coal and other fossil fuels being burned. Atmospheric carbon dioxide is presently (2015) about 400 parts per million (ppm), up from 280 ppm prior to the industrial revolution. When carbon is burned, carbon dioxide is created and oxygen is removed from the atmosphere. Falling oxygen levels in the atmosphere are potentially of great concern to humans. However, when plants breathe in carbon dioxide they breathe out oxygen. Hopefully, as carbon dioxide levels rise, vegetation will return sufficient oxygen to the atmosphere to meet human requirements. However, there is no guarantee of this, and the measurably falling oxygen level in the atmosphere indicates that the oxygen from vegetation is not enough. In addition to limiting the burning of fossil fuels, humans can assist by covering the planet with vegetation and by ensuring that global soils have the minerals required for healthy plant growth. Our survival may depend on this. Let the entire world be a garden. Carbon can be stored in soil as humus. Humus is black in color due to the organic carbon it contains. Healthy soil has a high level of humus, and high humus soils are black. In addition to our survival, we might give some consideration to the survival of life in the oceans. As carbon dioxide becomes dissolved in the oceans it forms carbonic acid. Search the internet for "ocean acidification". This acidification of the oceans makes it increasingly difficult for shellfish (crustaceans) to form their shells. The base of the food chain in the oceans is phytoplankton and zooplankton, plus shrimp and krill. The phytoplankton are plants and derive energy from sunlight by means of chlorophyll. Most of the zooplankton are tiny crustaceans, as are the shrimp and krill. The zooplankton eat phytoplankton and ocean detritus. If the zooplankton die off (due to ocean acidification) then the phytoplankton can grow uncontrollably. The result is algae blooms in the ocean. As these algae die, their decomposing bodies consume the oxygen in the water, creating hypoxic dead zones that kill virtually every creature that enters them. Dead zones in the world's oceans are increasing. You also might like to search the internet for "pacific ocean dead zone fukushima". The people behind the nuclear industry must have a lot of influence to keep governments and the news media silent on this subject. Molten salt reactors using thorium as fuel instead of uranium are safer. Thorium has always been the better choice for peace-time nuclear fuel. Uranium was chosen during the cold war because it produces plutonium that can be used to make bombs. Thorium does not make plutonium. Search the Internet for more information. There may be other ways to lose oxygen from the atmosphere. Cosmic rays can be protons, electrons, or larger particles. Protons become hydrogen in the Earth's atmosphere and this hydrogen may combine with oxygen to form water, which falls to Earth 1, 2, 3. There is also the suggestion that ionized atmospheric oxygen can blow off into space or that the atmosphere can be affected in other ways. 1, 2, 3, 4, 5, 6, 7, 8, 9, 10, 11. A supervolcano can produce a decades long volcanic winter. A supervolcano eruption is about a thousand times larger than a regular volcanic eruption. The Lake Toba supervolcano eruption occurred about 70,000 years ago. The human population of Earth was reduced to about 10,000 individuals, who survived along the coast of South Africa living on seafood. Plus, a small number of people may have survived in other places such as India. Scientists have located 10 to 12 supervolcano sites on Earth. Our question is this: With the simultaneous weakening of the Sun's activity and the Earth's magnetic field and the resulting influx of cosmic rays heating up the Earth's silica-rich magma, is there any chance of a supervolcano eruption happening any time soon? The Yellowstone supervolcano seems to be perking up. Presumably all the silica-rich volcanoes and supervolcanoes on Earth are heating up simultaneously. There is a connection between volcanoes, earthquakes, megaquakes, tsunamis and mega-tsunamis. The island of La Palma in the Canary Islands has the potential to dump a landslide containing 100 to 200 cubic miles of volcanic ash into the Atlantic Ocean, potentially causing a mega-tsunami around much of the Atlantic including the East Coast of North America 1, 2. A comparable mega-tsunami could happen in the Pacific if Hawaii's Hilina Slump slides into the ocean. The Cascadia 1, 2 and San Andreas fault lines are locked and loaded. The New Madrid seismic zone 1, 2, 3 threatens the central United States with a potential megaquake. Similar situations can be found around the world. "And if those days had not been shortened, no human being would be saved..." - Matthew 24:22. When Major Ed Dames and his remote viewers looked into the future, they expected to see mankind progressing nicely. Instead they found a depopulated world in ruins. The few remaining members of humanity survived in caves, mines and underground bunkers. When the dinosaurs all died, our ancestors the small mammals survived in underground tunnels with their store of nuts and seeds. May we learn from their example. The future is not fixed. Rather there is a range of probable futures. On the individual level, each choice you make impacts your future. On the collective level, the actual future that occurs will be influenced by choices made by humanity. You might think that some things like the weather, the impact of Earth's magnetic field, or the activity of the sun are too large or remote to be influenced by humans. This may seem true in our present level of consciousness, but if humanity rises to higher states of consciousness, nothing is impossible. Points to Ponder 1, 2. On the other hand, in the prophecy of Saint Malachy, the present pope will be the last. According to Saint Malachy, this pope "will pasture his sheep in many tribulations, and when these things are finished, the city of seven hills will be destroyed, and the dreadful judge will judge his people. The End." Mother Shipton is slightly more optimistic. She writes that after the mass die-off a terrible stink will arise from the polluted lands, but new lands will emerge from the sea and there the few survivors will "begin the human race again." These humans will "Enlighten the minds of future man" and create "The Golden Age". Kryon 2018 June, "There is a mini ice age coming. Don't fear it. Just understand it is going to get colder." 146. ...prophecies are always changeable and can be changed for the better if man makes positive changes in his thoughts, feelings and actions, leading to that which is better and positively progressive. 147. Prophecies always rest upon specific causes; these again result in certain effects, whereby these effects can be changed at any time if only the preceding causes are changed in their form. 285. ...which causes a change in climate, leading to a new ice age. Barbara Marciniak, "By 2027, the end of the changeover years, there will be many less people on the planet, and the people that are here are going to have their eyes opened wide." Barbara Marciniak, "The moon is a satellite that was constructed. It was built and anchored outside Earth's atmosphere as a mediating and monitoring device, a supercomputer or eye in the sky. It affects all life forms on this planet beyond what you can currently grasp. In your history there are references to two moons around Earth. You don't hear of this often, but there are those who know. At this time the moon is quite controlled... Extraterrestrials and others have many bases on the moon and those of Earth have little influence when it comes down to it. It is the extraterrestrials who really operate it all. Your technology, though rapidly advancing, cannot begin to compare to the biotechnology of sentient space travellers. You are newcomers to the game, and you miss a vital key where your senses and the essence of your physical world structure reality in a particular way. You constantly translate data and like interpreting a dream condense the experience into physical boundaries where you find that you can explain less and less. All is thought." (3:34) Alex Collier "Moon is an artificial alien base". Who Built the Moon? by Christopher Knight and Alan Butler (1049 pages). Question: "I have heard the years between now and 2027 referred to as the "transition years" or the "changeover years". What does this mean? What is the significance of the year 2027?" Answer: "OK. 2027 is the last year that they're going to use for people to ascend up higher. After that you're just going to be taken to another 3D planet, folks. You're going to have to wait another, you know, 26,000 years before you can get a chance to ascend again. I don't recommend that, OK? You all come on and go with us. Come on." Kent agrees that we are entering a mini-ice age. However, he says that the planet is quickly rising in vibratory rate to 4D and this increased rate of vibration will cause the polar ice caps and Greenland ice sheet to melt, resulting in rising sea levels. He says all the ice will have melted by 2024, and to be safe you should be at least 600 to 700 feet above the present sea level. Kent is also very concerned about nanotechnology that he says has been a component in chemtrails sprayed since the 1990's. This nanotechnology is in our food, water and the air we breathe. As a result, there is a growing amount of nanotechnology in all living creatures including humans. He says that as the energy of Earth rises to 4D, the nanoparticles in your body will be activated by this energy. The nanoparticles will stack together to form strings within your body, which will penetrate your brain, heart and other organs. He says that the nanotechnology has only one purpose and that is to kill you. It is part of the Cabal program to reduce the population of Earth. To remove the nano technology from your body, Kent suggests that the U.S. military developed a special way to process zeolite in order to clean it and create the right particle size. Some of the particles need to be large enough to stay in the colon, thereby cleansing it. Some of the particles need to be small enough to enter the bloodstream and travel everywhere in the body. The zeolite Kent recommends comes from https://thegoodinside.com/. There is also zeolite available at Amazon. If you order zeolite from thegoodinside.com please tell them Kent Dunn sent you. "We're talking about decades of cold weather, decades of earthquakes of 7.0 to 8.0, possibly a Cascadia eruption much larger than that, on and on and on. We are looking at the most dangerous geophysical period in human history according to our research between this year  and 2038. So I'm not aware of anyone that's actually gone in and analyzed the potential impact, but needless to say, more Americans will die in the next 10 to 15 years than ever before in our country's history, not by mankind, but by natural forces - cold climate ill effects, crop losses, civil disturbances that occur as a result, and then earthquakes and volcanic activity. So not a good time to be around, but it's the best time right now to start getting prepared." John Casey starting about 1:03:30. Greenland Ice Sheet increasing. Source of chart Danish Meteorological Institute. Arctic Sea Ice Volume above average. Source of chart Danish Meteorological Institute. Antarctic Sea Ice. Source of chart National Snow and Ice Data Center. 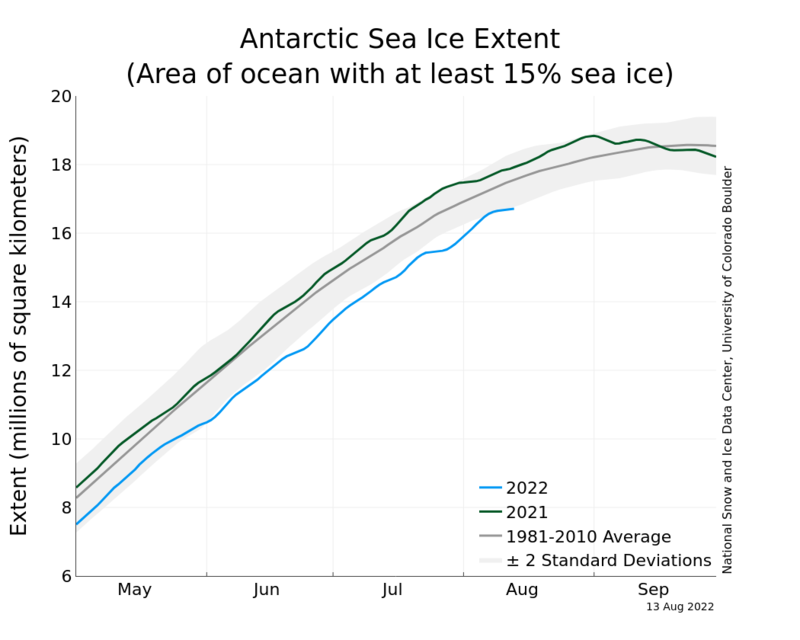 East Antarctic is gaining ice. caused by volcanic activity and hotsprings 1, 2 under the ice. Overall, the Antarctic land ice seems to be about in balance. Source of sea level chart. Mass dieoff of Antarctic penguin chicks due to increased sea ice - 2017. This page is updated regularly as new information becomes available. We now move on to page two of our three page mini-series on agriculture to prevent cancer. Now that we understand the importance of better food to provide a foundation for better health, how can the careful shopper know which fruits and vegetables are the best? Hippocrates, the Father of Medicine, told us, "Let thy medicine be thy food and thy food be thy medicine." It is the skill of the cook to put maximum nutrition in food. Fortunately there is a way to test fruits and vegetables to measure their nutritional content before you buy them. All you need is a small quantity of juice from the fruit or vegetable and a simple instrument called a Refractometer.